An option to relocate the Kawasaki Vulcan ignition switch to the gas tank dash panel is to use the kit from Thunder Mfg. This is only available for the Vulcan VN1500 bikes (Classic, Nomad, & Drifter model motorcycles) which have the 4.2 gallon gas tank and the mechanical speedometer. The 1500cc & 1600cc model bikes, with the 5.0 gallon and 5.3 gallon gas tanks respectfully, have the electrical speedometer and do not have the recessed space needed below the dash panel for the clearance required underneath the ignition switch. Apparently, the VN800 Vulcan model bikes do not have the required space needed underneath the dash either. See Pics below. This picture shows the Thunder Mfg. 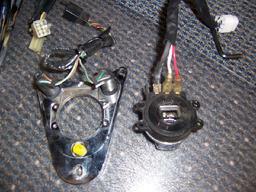 harness which has the Kawi OEM plug on one end and the slip on connectors on the other. 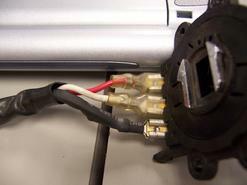 This makes the harness 'plug-n-play' for the connection to the Kawasaki wiring harness. 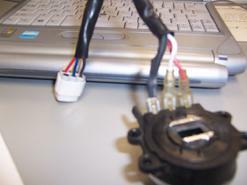 A close up view of the OEM style plug and the five wires. The wire colors appear to be red, yellow, white, brown and blue with the sixth slot open or free. This is the wiring diagram I made of my Thunder Mfg. Ignition harness. It shows the 100 Ohm resistor in-line the yellow wire. Thunder did a good job with these new plug-n-play harnesses. I haven't had a problem with the infamous resistor in the five years I've had mine installed, but just in case, I carry a spare ignition harness. This is a close up of the connections to the Thunder Mfg. switch. You can see the red and the white wires. The heat shrink is hiding the infamous resistor on the third connection. As of the end of year 2007, I have heard from others that Thunder Mfg. no longer provides the ignition harness has a plug-n-play version. Their current version does not have the OEM style connector so it must be spliced into your existing harness. It appears the company they used is no longer in business or is no longer making the harnesses for Thunder Mfg. 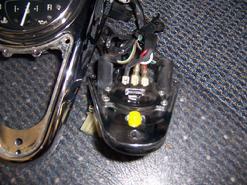 An alternative would be to cut the connector of your existing ingnition switch harness as close as possible to your stock OEM Kawasaki ignition switch; do not cut the wires off at the end by the connector plug. When done properly, you will end up with an ignition switch in one hand and a harness (with the connector plug attached) in the other hand. You can then wire the Thunder Mfg. harness to your Kawasaki ignition harness following the wiring diagram shown on this page. Ignore the wire colors used by Thunder Mfg. 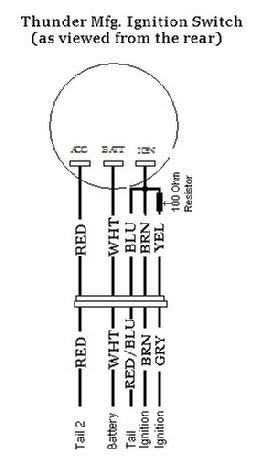 in the wiring diagram but be sure to invlude the 100-ohm 1/2 watt resistor as shown. Retaing the connector from your old OEM Kawasaki ignition switch will ensure your Harley style ignition switch is now plug-n-play with the chassis harness on your bike. I decided I wanted to add 4-way hazard flasher lights on my bike. I studied the website on gadget's page and I liked Ray Haefy�s design, except I also wanted to control the power to the signal flasher. 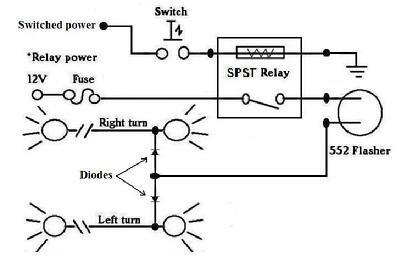 Given the limited space available inside the left side panel, I chose to use a SPST (single pole, single throw) relay to control the power to the signal flasher which in turn sends the intermittent (flasher) power to the turn signals. I also used diodes to isolate the turn signal wiring and avoid electrical feedback. You can click on the diagram to the right to enlarge it and see how I modified Ray's diagram to suit my needs. 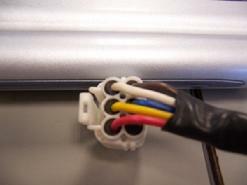 I used the red Accessory wire in the above ignition wiring diagram as my switched power source. The hazard lights will only work if I have the ignition in "Acc" or "On" and will not work with the ignition "Off". That way, someone can not inadvertently switch my hazards on while I'm away from the bike and run my battery down. Because of the similarities, this should work for either a Road King headlight nacelle or a Gilroy Indian Chief (1999-2003) headlight nacelle when installing on a Kawasaki Vulcan Classic 1500/800 or Kawasaki Vulcan Drifter 1500/800. This was my bike with the stock front-end. The Nomad front-end was 1� too wide to install the R-K headlight nacelle, so I swapped it with the front-end from a 2003 Vulcan Classic 1500. I have to especially thank Philip Reece who traded front-ends with me. This is the bike with the front-end removed. The Nomad steering stem is a larger diameter than that for the Vulcan Classic, so a machine shop modified both triple-trees to use the steering stem from the other. The Vulcan Classic 1500 front-end installed and test fit of the H-D headlight nacelle. I first tried the headlight nacelle over the top triple-tree clamp, but did not like the gap between the bottom of the headlight nacelle and the lower triple-tree clamp. I then test fit the nacelle below the top triple-tree clamp and decided that was how I will mount it. I wanted to use the stock Road King lightbar, spotlights, and turn signals along with a quick release windshield. I used Doss brackets P/N 26892 attached to the Kawasaki forks via standard 1-1/4� split-ring hanger plumbing pipe clamps. This allowed me to position the studs properly for the mounting holes on the headlight nacelle sides. I originally used a hole saw and drilled holes for the fork tubes to go through. This worked but I later decided to open up the entire area under the top triple-tree clamp so that each half could be mounted from the side to ease in future removal and installation. This is how it looked during one of the test fits. I took my time fitting the nacelle, marking the areas to cut or trim and test fitting it again and again. I later cut out most of the area under the top triple-tree clamp. Since the headlight nacelle is constructed in a left half and a right half bolted together, the additional cutting to open the top made it much easier to remove and reinstall the nacelle in the future. As you may notice, the brackets were a tad too long so they were cut a bit shorter as not to hang below the nacelle skirt. You can see how the whole setup is lining up. I am pleased with the work, so far. The lightbar mounts like it would on a stock Road King. I had to add washers to make up the gap on the top mounting bolts, but it turned out good. The quick release windshield works perfectly with the lightbar. 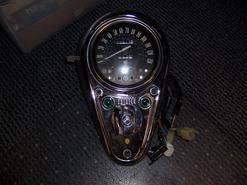 I used Road King quick release mounting hardware P/N 58221-04 which I ordered from Harley Davidson for $20 at the time. Here you see the finished product. I painted the headlight nacelle black to go along with a the black and grey paint theme I have planned for the bike in the near future. 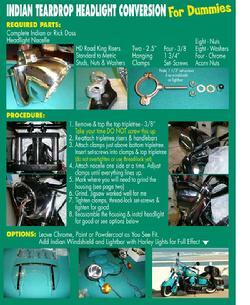 The following shows how I later changed things a bit and installed 2006 Harley Davidson Fatboy front-end, forks and front wheel on my Kawasaki Vulcan Nomad. I also installed a Rick Doss teardrop headlight nacelle, similar to the Gilroy Indian Chief headlight nacelle, in a similar manner as I previously did with the Road King headlight. 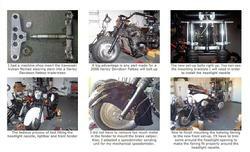 I had a machine shop insert the Kawasaki Vulcan Nomad steering stem into a Harley Davidson Fatboy triple-trees. A big advatange is any part made for a 2006 Harley Davidson Fatboy will bolt up. The new Fatboy front-end bolts right up. You can see the mounting brackets I will need in order to install the Teardrop headlight nacelle. The tedious process of test fitting the headlight nacelle, lightbar and front fender. I did not have to remove too much metal in the Indian fender to mount the Fatboy brake caliper. Also, I adapted a speedometer sending unit for my mechanical speedometer. Now to finish mounting the detachable batwing fairing to the new front set-up. I�ll have to trim some around the headlight opening to make the fairing fir properly around the headlight nacelle. Below left are downloadable pictures of my How-to headlight instructions illustrated above. 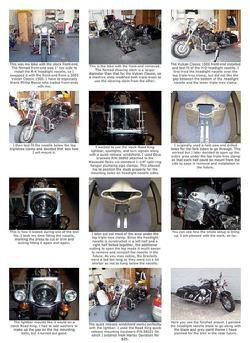 Below right, is an �Indian Teardrop Headlight Conversion for Dummies�. This was made by Leonardo and it illustrates how he installed a Gilroy Indian headlight nacelle on his Kawasaki Vulcan Drifter.